Let us introduce you to Evelind Schecter, the co-founder of Warm Heart Worldwide. Since 2008, it operates a Children’s Home which today has grown to 45 children in-house and community public health programs for children, the elderly and disabled. They also run a microenterprise program for landless women that creates amazing handmade items. Tell us, Evelind, what is the story behind Warm Heart? ​Our original focus was on economic development through education and microenterprise. We later got involved in public health as people came to see us to help solve problems or find resources. Microenterprise with traditional handicrafts was a natural extension of my lifelong passion for beautiful handcrafted objects. I lived in Japan and Hong Kong as a child. Through the years I collected pieces of Thai silk and I still treasure them now. 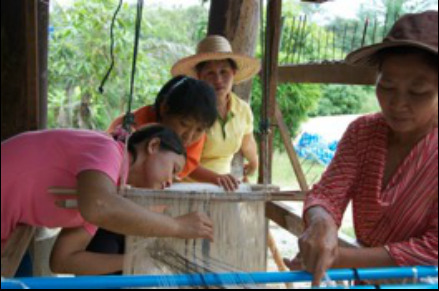 What have you learned by working with handicrafts? At one point, we got involved in raising silk worms and I loved learning about all the issues involved in keeping them alive so that they could make their silk cocoons. We eventually had to ​abandon worm growing as it is economically unviable. We now source our handspun undyed eri silk yarn locally or from northern India. 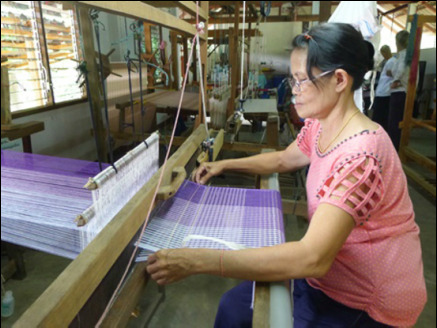 But we still do the rest of our silk production entirely by hand. 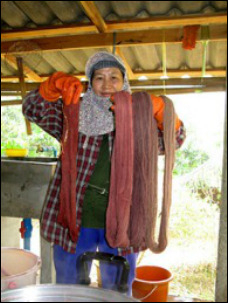 We also natural dye cotton yarn and use a lot of commercially dyed cotton or rayon yarn for our more affordable scarves. ​Working with natural dyes is magical – we start with green leaves and end up with a spectrum of colors. Setting up a weave can take three days. It always amazes me that the weavers can visualize the pattern before they do the warp set-up and out comes a gorgeous piece of woven material. Tell us more about the people you work with. 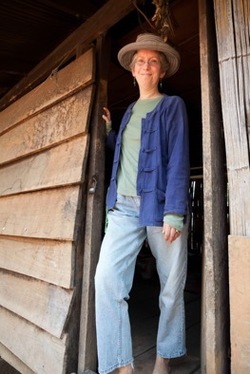 We work regularly with three co-ops: one for dyeing and weaving, a second for making jewelry and a third for sewn products mostly using recycled rice bags. 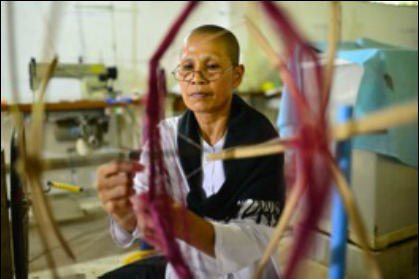 Our main dyeing/weaving co-op is headed by two amazing Buddhist nun sisters who are incredibly skilled and creative. Even though we have worked with them for over seven years, we´ve only just begun to tap their talents. The number of women in the groups fluctuates depending on the time of the year and the size of orders but we are a very small operation. Can you explain what impact your company has on the women's lives? The women in the co-ops have never had external sources of revenue and use their earnings to pay for food, schooling for their children and basic health care. We try to pay them the current national minimum daily wage of USD10 (which is quite high for rural Asia). The women´s first priority is working in the fields and taking care of their families; working with us provides income during the months when they are freer. We adapt our production schedules to their availability. In what other ways is microenterprise important to your organization? Microenterprise is a consistently popular project area for Warm Heart´s many international volunteers who are sometimes able to make real contributions and gain practical, hands-on experience. A volunteer from Mainland China who had never had previous retail experience was responsible for expanding our Chiang Mai retail store network. ​A volunteer from Holland designed our first collection of wrap bracelets in 2014 and has now done three more collections. Two years ago we had two more recent textile university graduates from Canada who also designed and produced their own mini-collections. An important element of Microenterprise is how the entire supply chain is linked, from the makers to our wholesale customers worldwide, to our end consumers. Everybody has input in what products we make; traditional designs and materials are often tweaked for today´s global marketplace. As the beautiful and useful products make their way out into the world, so too does Warm Heart´s story and aspirations. ​Where do you see your company in the next few years? ​Our goal is to leverage the designs and marketing expertise of our customers to steadily build volume and to one day have a full-time cooperative of weavers, sewers and accessory makers.